Rack of lamb is a prized joint, both tasty and tender if treated with some respect. It is usually presented French trimmed, meaning the tougher muscle is removed from between the ribs which are then left protruding. Any decent butcher will do this for you. I use F. Norman in Oakwood, North London. I've noted the supermarket packs also tend to remove the top fat and so, much of the flavour. Racks can be sewn together and formed into a crown. But that's too fancy for my table. 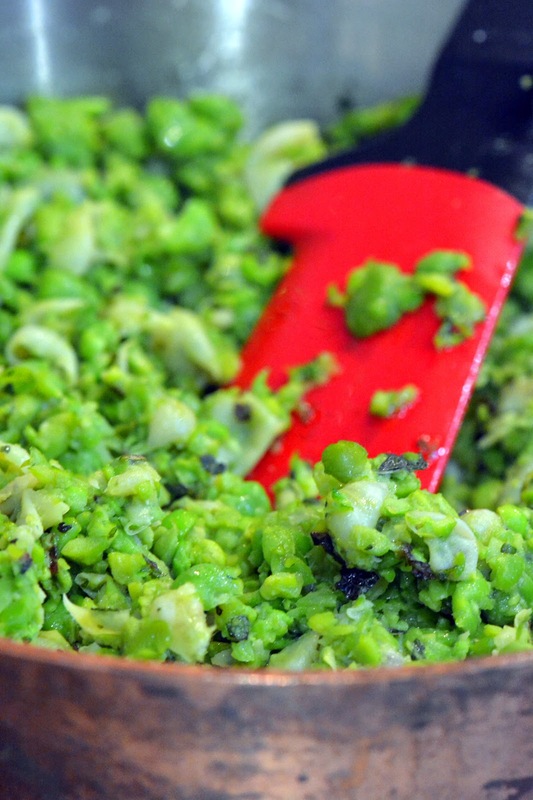 I serve the meat with a simple dish of crushed broad beans and peas that have been blanched and then heated with olive oil, mint and marjoram. The flavours as well as the colours complementing well. Crusting the meat. Vibrant and tasty. This dish is based on a Gordon Ramsey recipe but there are many others just like it. You need three ribs per person. Racks are normally eight or nine ribs. This recipe has the advantage that the lamb is cooked once then rested before being crusted and cooked again just before serving. 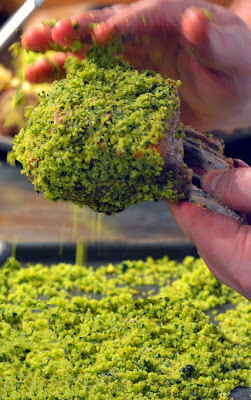 Make your herby crust mix by mixing two handfuls of breadcrumbs with about a half handful of grated parmesan. Blend this with a good sprig of parsley, coriander, thyme and rosemary. Add a drizzle of olive oil until the mix comes together. It should be an attractive and vivid green. Add more parsley if it's not. After scoring the top fat and seasoning well with salt and pepper, sear all sides of the rack in a smoking hot pan. You want a good brown colour. Now roast the meat for around 12-15 minutes (depending on the size of the rack) at 220°C. I was using organic Gloucestershire lamb and these were fairly hefty. Supermarket cuts seem to be more delicate. Out of the oven and while still warm, brush liberally with Dijon mustard. The mustard will melt into the meat. Then press the meat into a tray of the crust mix, coating all sides. The meat should be rested for at least 20 minutes... or until needed. For a pink medium eat, the lamb should be returned to the 200°C oven for another 10-12 minutes, but again, if the joint is small, make an inspection cut before time. When ready, cover with foil and let rest for ten minutes. Then joint the lamb into chops and plate up. The one downside of a rack: it yields little roasting juice. Instead, I make a stock of the roasted meat trimmings with a chopped roasted shallot and some rosemary in two litres of water. No trimmings? Try a half kilo of scrag end - a couple of quid at most - roasted for thirty minutes at 220°C. Reduce this right down to almost a syrup, adding a good glass of port and a tablespoon of redcurrant jelly towards the end. No it's really not like mushy peas. I'm actually a big fan of the guacamole of the North and this ain't it. Take 400g each of frozen petit pois and baby broad beans (Waitrose sells these). The baby versions are sweeter than their elder siblings. Frozen? I know, I know, but unless you are literally podding yourself and walking the produce to the kitchen table then frozen is best. So called 'fresh' peas in the supermarket are like lead shot even after a day or two. Blanch both peas and beans separately for a couple of minutes in plenty of boiling water, until they float. Plunge into ice water (the legumes not you) and set aside until needed. Before serving, in a blender or (better) food processor, whizz up the pea/bean mix with a tablespoon each of fresh mint and marjoram. Make an effort to find the marjoram, it's an intriguing flavour, like a more erudite and interesting oregano. Don't puree the veg, you want texture. Add 180ml of good olive oil and gently heat. Why gentle? Because a fierce heat will turn those luscious greens to an unappetising dun. Finish off with a seasoning of salt and white pepper and the juice of half a lemon. To serve, put a mound (must be a better word than mound? Heap? Pile? Nope.) 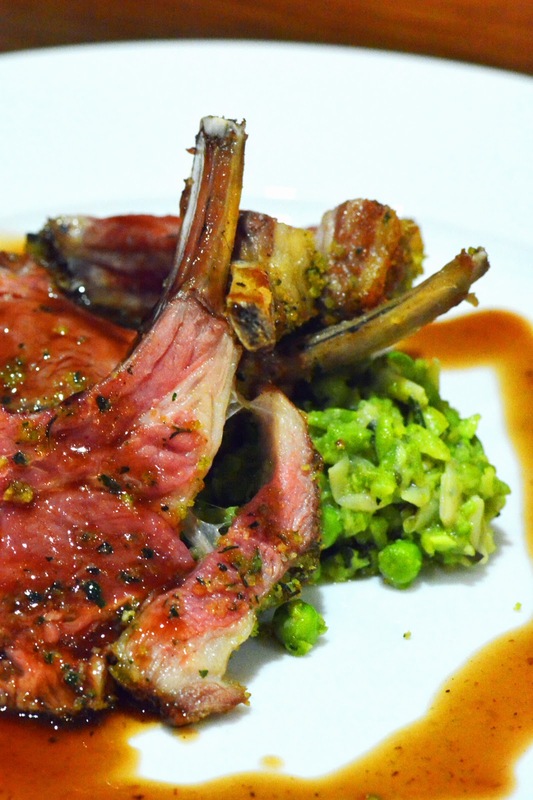 of peas in the centre of the plate, surrounded by three chops and a drizzle of lamb and port reduction. I'd serve them with a deep dish of potatoes dauphinoise but you could go lighter. Perhaps some Yorkshires? They aren't just for beef. Some of the photos here were taken by my friend Bee Rawlinson. You can see more of her excellent work here. She can find beauty in the most mundane of subjects (apart from me - she did try). You'll also see much more of her work on this blog in the coming months. If you need a food photographer, let me know and I'll put you in touch.